Like World War II's iconic "Rosie the Riveter," newly minted Salt Lake County Sheriff Rosie Rivera, 55, is a plucky woman in a traditionally man's job. Last August, county Democrats appointed Rivera to fill the vacancy left by Sheriff Jim Winder, who resigned to become Moab's chief of police. She's the mother of three and grandmother of five. 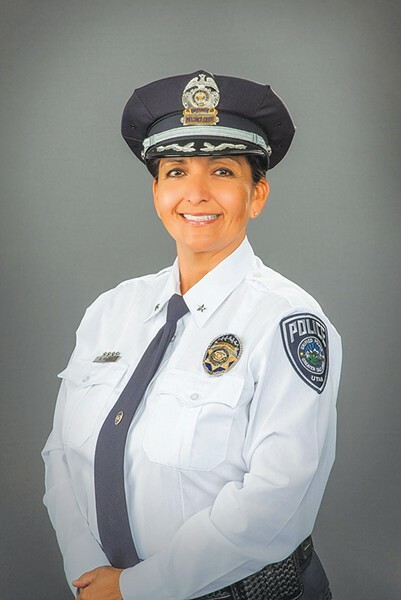 The county's first female and Latina sheriff—who heads the sprawling Unified Police Department—is seeking a term of her own this November. What attracted you to law enforcement? I have always wanted to be a police officer since I was a little girl. My father watched cop shows on TV and I wanted to be just like them—helping people. You rose through the ranks, correct? I started my law enforcement career at Weber State University Police Department in 1993. [After joining the sheriff's office], I made sergeant in five years, then lieutenant after 15 years, chief after 22 years and sheriff after 24 years in law enforcement. What were those early struggles like as a teenager? As a teenager, I became pregnant at age 14. The culture back then in Latino families was to get married if you became pregnant. I married my son's father at 14; he was 16. I had my son when I was 15 and the struggles began. I had to drop out of school to support my child and worked the onion fields to earn money ... I was on public assistance for a few years until my husband at the time turned 18. Then, he got a job at Hill Air Force Base and we no longer needed assistance. When I was old enough, I also got a job at Hill and we were able to support our family. Any advice to women interested in a law-enforcement career? Pursue your education first. Always remember that just because it is a male-dominated field you can do it, too. In order to be it—you have to see it. What I mean by this is you have to see yourself in the future in order to pursue your goals and dreams. What's currently your biggest challenge? The biggest challenge right now is recruiting enough resources to do the job. We are short on manpower in corrections and the Unified Police Department. What are your long-term goals for the department? To encourage police and the community to work together more closely. I also want to decrease the gang violence that is going on in the county; it has become more violent and the gang members are starting at a younger age. Another goal is to provide the most effective policing without it costing communities so much. I believe the unified-police model saves cities money by sharing resources among the cities.